Do galaxies orbit around a point, or do they just go around in the universe freely? Neither (or maybe the second depending on how you mean "freely"). Galaxies are arranged into clusters and filaments by their mutual gravitational attraction, guided by dark matter. 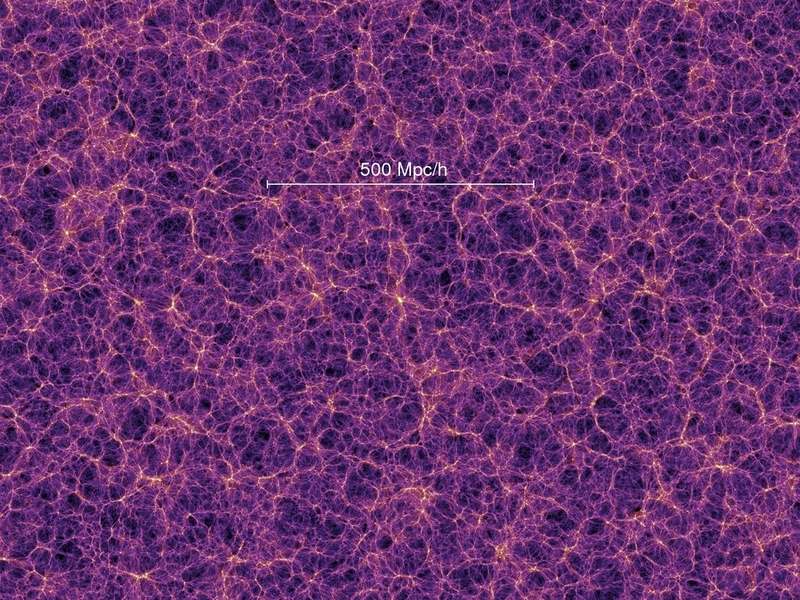 As the universe ages, the galaxies tend to clump into larger and larger clusters, which also tend to get farther and farther from each other, connected by ever diminishing filaments of dark matter, other galaxies, and intergalactic gas. They're grouped into clusters that orbit around a common center of mass, like any star system. I thought he meant did ALL galaxies in the universe orbit around a common point. In short -- what Harb said. Galaxies are organized into clusters by their mutual gravity, and clusters of clusters (superclusters), up to scales of about 100Mpc. These in turn are arranged in a sort of bubbly/filamentary structure as seen in Harbinger's image, for which dark matter plays a major role. And as far as we can tell, there is no larger structure in the universe than this. As far as galactic motions are concerned, within clusters they all orbit around the collective center of mass, which often tends to be a giant elliptical galaxy built up by collisions. On a universal scale, however, there is no organized motion. It is often said that galaxies are all moving away from us, but this is not actually the motion of the galaxies through space, but rather an effect of the expansion of the universe. And as far as we can tell, there is no larger structure in the universe than this. There is a thread with more on this here, if anyone's interested. While Saturn, Neptune, and (sort of) Uranus all have ring systems, as far as I know, they are all in circular orbits. So, is it possible for eccentric rings to exist, and if not, why is that? Hi themohawkninja, this is the best place for astronomy Q&A so I moved your post here. Eccentric rings can't exist in nature, because collisions between particles will naturally cause their orbits to circularize. Moonlets also play a role in regulating the rings, and the orbits of the moonlets themselves are circularized by tidal effects. If a large body came by and disturbed the rings then they could become eccentric, but it would only be a temporary change. OK here's a quick question I just thought of. If you have something with a mass of - let's say 10 kilograms - and you would need for it to be 20 kilograms. You add a weight on the thing. It now weighs 10.1 Kilograms. You add another weight on it. It's now 10.11 kilograms. You add another weight on it. It's now 10.111 Kilograms. Would the weigh of that object ever get to 20? but it's confusing for me. I'm not sure if this is the right place to ask this, but this was the most related. Since decreasing the weight by a factor 10 each time makes them smaller much faster than decreasing them by a factor 2, you'd never even reach 12 kg, much less 20.
you'd never even reach 12 kg, much less 20. Just look at the pattern you've constructed. It will just keep going and end up being 10.111111111111111111111111111..., so clearly it would never get to 20, or 11, or even 10.2. Mod edit: Question referring to HD 20782 b moved from the Space Anomalies thread. Its mass indicates that it's a gas giant. Wouldn't a gas giant have noticeable atmosphere loss at the high temperatures this planet experiences near periapsis? EDIT: Also, can we expect it to have some odd spin-orbit resonance due to its extremely close periapsis? Something like Mercury's 3-2 but with a more extreme ratio? Noticeable meaning detectable, maybe, but it does not make much difference to the planet even over astronomical timescales. Hot Jupiters lose mass primarily due to their atmospheres being heated by the star's UV radiation, and over the main sequence lifetime that may occur at rates of several million kilograms per second. That might sound like a lot, but it amounts to one Jupiter mass over trillions of years, or less than one percent of the planet's mass since its formation. The heating for HD 20782 b would also only last for a short time as it swings through periapsis, as opposed to the whole orbit as with typical Hot Jupiters. Spin-orbit resonance is an interesting and very challenging question. There is a tendency for higher-order resonances to be stable at greater eccentricities, but there are many confounding factors. I haven't a clue what would or could happen with this planet. By the way, if you're wondering how it got on such an eccentric orbit, it is because of the Kozai Mechanism, where the eccentricity and inclination changes dramatically due to the presence of a highly inclined companion, like a binary star. It is theorized that this mechanism explains the existence of many such high-eccentricity planets. How about Bode's law, what's its current status? Do exoplanet data utterly kill the law or is it still something in it? Ah, the ever controversial Titius-Bode relation. Short answer: The data doesn't invalidate it, but it is too early to draw meaningful conclusions. There have been a couple studies, which show that a Titius-Bode type of relation is consistent with some systems, with some caveats added. One issue I see is that just because a system appears to fit the relation does not mean it actually does -- there may be additional, inconsistently-located planets in the system whose radial velocity signals are too weak to pick up yet. Or, the relation may appear to fit but with hidden 'predicted' planets, that don't actually exist. The robustness of the relation would be well demonstrated if a planet is predicted to exist by it and then found. Then again, that's what happened in our solar system with Uranus and the asteroid belt, and then we found Neptune which doesn't fit at all. So it's tough, and we need many confirmations in many systems to prove the rule. I'd like to see the problem tackled from the theoretical/modelling side in addition to empirical data. Something which shows that the relation arises naturally out of solar system evolution, considering also the effects of resonances, migration, etc, would be very compelling. Edit: Would anyone mind if I move these posts to the Astronomy Questions thread? Would anyone mind if I move these posts to the Astronomy Questions thread? Question: How exactly are Cephid Variables used to measure distance as a standard candle? While I understand that they have a given magnitude, and therefore you can equate the distance to the variable by relating the apparent magnitude to the absolute magnitude; how do we know that the object, to which the variable is being used as a standard candle for, isn't actually much farther away, or closer to Earth? how do we know that the object, to which the variable is being used as a standard candle for, isn't actually much farther away, or closer to Earth? For one thing, we could compare the radial velocity and proper motion of the variable and the object you're trying to measure and see if they match up. But even that isn't totally necessary. If we see a dozen Cepheids in the same part of the sky as the Large Magellanic cloud, and they're all roughly the same distance away, and clearly outside of our galaxy, then it's pretty obvious that they are a part of the Large Magellanic cloud, and thus are the same distance away that it is.